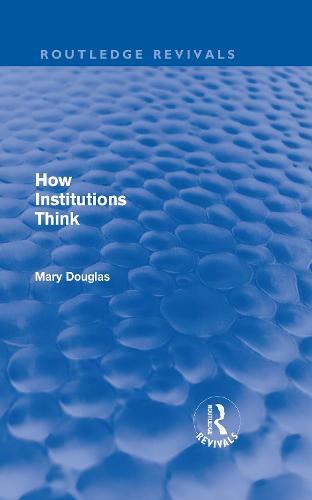 First published in 1986 Mary Douglas' theory of institutions uses the sociological theories of Emile Durkheim and Ludwig Fleck to determine not only how institutions think, but also the extent to which thinking itself is dependent upon institutions. Different kinds of institutions allow individuals to think different kinds of thoughts and to respond to different emotions. It is just as difficult to explain how individuals come to share the categories of their thought as to explain how they ever manage to sink their private interests for a common good. Douglas forewarns us that institutions do not think independently, nor do they have purposes, nor do they build themselves. As we construct our institutions, we are squeezing each other's ideas into a common shape in order to prove their legitimacy by sheer numbers. She admonishes us not to take comfort in the thought that primitives may think through institutions, but moderns decide on important issues individually. Our legitimated institutions make major decisions, and these decisions always involve ethical principles.